This is a guest blog written by Chris Eirschele. I come at garlic mustard from the perspective of a master gardener, the type of volunteers often charged with pulling out the plants by their blooms each spring. The herb, unwanted around native plants at wooded gardens all over Wisconsin, required deliberate effort to eradicate. Alliaria petiolata is nonnative garlic mustard, bestowed on North America by well-meaning ancestors moving from Europe who brought it along to cook and heal with. First putting down roots in the late 1860s on Long Island, New York, the biennial herb quickly spread into natural areas where the plant could find cool growing seasons and nothing to keep it in check. The main threat, to woodland gardens and natural plant sites, is the garlic mustard’s easy ability to naturalize in shady locations, spreading viable seed early in spring. 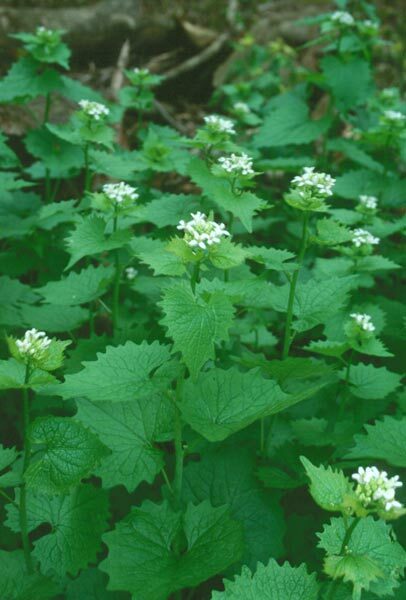 Garlic mustard plants are termed ecologically invasive. It would be so easy if only Roundup® could be sprayed with abandon to eliminate the invasive bully, especially when temperatures are cool in late fall or early spring. But the systematic herbicide glyphosate kills on contact making it difficult to protect surrounding plants from wind drift. If ever, a botanical park would be an unlikely setting, in mass, for the spray’s use. Volunteers who annually meet setting out to destroy garlic mustard plants usually use mechanical methods; hand pulling and bagging flowers. They haul in a second set of shoes, gloves, plastic bags and strong arm muscles to do their worst. Seeds from the intruders are not allowed an easy ride out of the woods; hence the second pair of shoes. By the second year of growth, garlic mustard is shading out early spring flowering plants, including threatened native plants. Where forested landscapes grow wild ginger, Dutchman’s breeches and trilliums, for instance, the garlic mustard competes for similar habitat, usually robbing natives of habitat and nutritional needs. And as nothing lives in a bubble, wildlife that depends on the pollen, nectar of true native plants are threatened too. One example is seen in the West Virginia white butterflies, their primary food source for the caterpillar is Dentaria. Although also in the mustard family, the chemicals produced by garlic mustard seem too toxic for the eggs of this butterfly. Native columbine, Aquilegia Canadensis, is a native wildflower sought by ruby-throated hummingbirds in eastern North American to pollinate in late spring. Shaded out by the unappetizing garlic mustard, the hummingbird goes away unsatisfied. Whether to destroy the plants or eat them, accurately identifying the garlic mustard plant is important. During the first year, dense mats of green basal rosettes are found; eventually the biennial plant grows 6” – 3.5’ tall with erect stems and a strong garlic scent. A handful of leaves will tell the tale when crushed. Garlic mustard flowers are comprised of small tubular four-petal white flowers. The racemes bloom April through June. After flowering signals the onslaught of the long narrow seed pods. But if you must, a sizable collection of garden mustard recipes exist. A recipe for wild garlic mustard pesto is very popular, but can be made with baby spinach or basil as well. 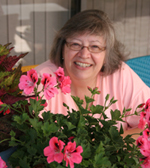 Chris Eirschele is a freelance garden writer who muses on Staygardening.com from her home in Arizona. A collection of her work may be found at suite101.com/chris-eirschele/ . Hey there, You’ve done an excellent job. I will definitely digg it and for my part suggest to my friends. I am sure they’ll be benefited from this website. I would never use RounUp it is extremely toxic. Plants take it up because they mistake it for glycine. It breaks the glycine cleavage system in the body because the body mistakes the glyphosate in it for glycine. It also kills our beneficial gut bacteria leaving the sulfur digesting ones become more numerous which causes high sulfite levels which causes many metabolic issues. The list goes on and on of how harmful it is. Even the supposed inert ingredients in RoundUp have been found to be harmful.